This role is a change for me, moving from product to consulting. But it’s one I embrace and I’m looking forward to. I’ve talked a lot here about the need to understand customers’ jobs-to-be-done. By working side-by-side with organizations, I’m going to have a deep understanding of their jobs-to-be-done for innovation and problem-solving. And even better, an opportunity to help make them successful. Over the past five years, I’ve worked with a number of customers and thought leaders in the innovation management space. People that are committed to and passionate about this. The first thing to know is that enterprises are actively exploring ways to be better at innovating. 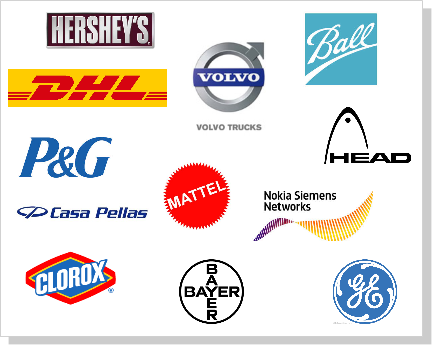 Many, many of the companies you know and buy products and services from. From its roots as online suggestions boxes, innovation management has become a full-fledged corporate discipline. 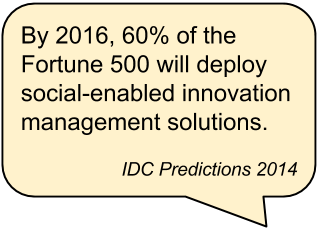 In fact, research firm IDC forecasts that by the end of 2016, 60% of the Fortune 500 will be using social-enabled innovation management solutions. 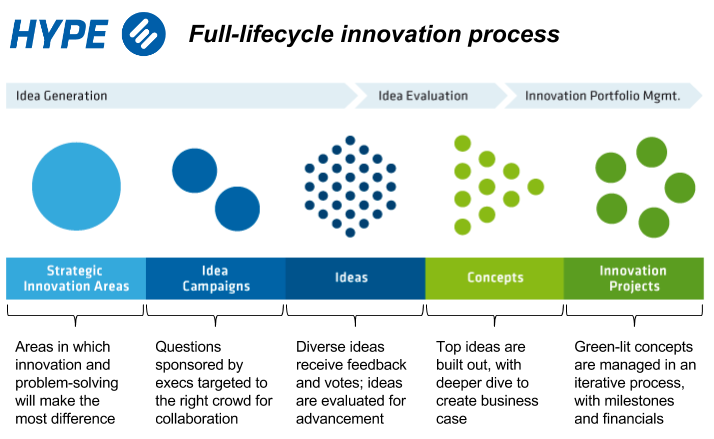 Which, if you follow the innovation diffusion lifecycle, means we’ll start to see the late majority taking it up. Innovation – however you define it – continues to be a prominent use case. And with good reason, as CEOs rate it a top priority. There are multiple disciplines that address innovation: crowdsourcing, design thinking, TRIZ, incubators, lean startup, etc. Generally, innovation is considered creating something new which adds value. Problem-solving: An example of this is cost-saving initiatives. People out on the front lines are seeing opportunities for improvement that are hidden from decision-makers in the headquarters. Positive deviance: In every large organization, there are people who have figured out a different, better way to do something. Crowdsourcing helps find these people, and their novel approaches can be identified and shared. Trend-spotting: With an army of employees out in the field, organizations have a ready way to canvas an area. People can post what they’re seeing, a valuable source of raw insight. As the market matures, companies are seeking ways to better advance the most promising ideas. This is where the puck’s heading. Innovation is a prominent use case that benefits from the application of social and collaboration. You can see more in Alan’s Slideshare presentation on innovation and purposeful collaboration. 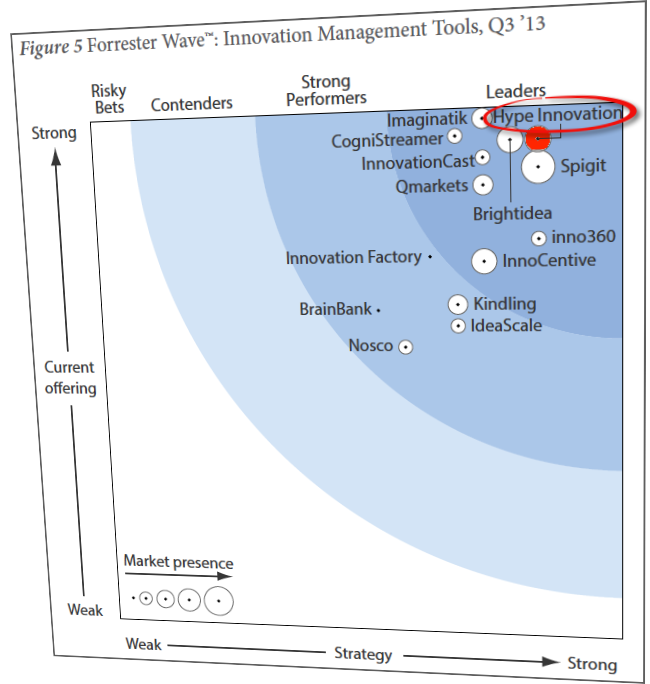 HYPE has over a decade of experience in the innovation market. It’s roots were in the R&D world, with a deep emphasis on how to maximize the value of ideas. In industry parlance, this is sometimes called the “back-end” of innovation. It’s a sophisticated activity with variance in process for each organization. Through the years of working with customers, HYPE has become adept at handling this phase of innovation. I know it’s not easy – I did some initial product work myself in this realm previously. Success here hinges on understanding what customers seek to achieve, and acting on it. With deep expertise built throughout the platform, HYPE is well-positioned to address organizations’ innovation jobs-to-be-done. In the past few years, HYPE has increased its presence in the market, following an investment from ViewPoint Capital Partners. From its roots in Germany, the company has become the leader in Europe. It is now seeing good growth in broader EMEA, the United States and South America. HYPE achieved the top overall ranking, the coveted “top right” position of the Wave. HYPE has over 170 customers from around the world. Consistent with my experience, the industries are varied. Some representative names are shown to the left. This is something one sees when it comes to innovation: everyone does it. There’s really not a specific sector that pursues innovation and problem-solving more than others. HYPE has a number of long-term relationships. And it’s fair to say that once you’re a client of HYPE, you’ll be happy, satisfied and get results. Annual churn is less than 4%. On a monthly basis, that’s roughly 0.3%, at the magic level for enterprise software companies. That level of customer satisfaction doesn’t “just happen”. Rather, it comes from being dedicated to customers’ success and working to make them successful at their jobs-to-be-done. Finally, about the HYPE logo. I actually do not yet know the background on it. But take a look at it. See some similarities to different hand gestures? I’m looking forward to joining the team. Good news for Hype. Great hire. Congrats Hutch!! I’m glad to hear that your focus on innovation management will continue and develop with a different role. Go get ’em!